Following From Berlin to LA 2016, From Berlin to LA 2017, and The Lab 2017, our new curation collaboration with the Goethe-Institut-LA for the opening of Deutschlandjahr 2018-2019 on October 5-6 at The Echo/Plex and Globe Theatre: FROM GERMANY TO LA an unmissable celebration of electronic sounds and visuals, delivered by a diverse lineup of DJs and performers representing eclectic communities from both sides of the pond, affordably priced and easy to get to with public transport. Visual enhancement comes from Cloaking, delivering a unique LA/Berlin blend of 3D mapping and lighting, plus projections by German video/photographers Lisa Wassmann and Valquire Veljkovic. The festival artwork was designed by rising star illustrator Opashona Ghosh (Kolkata/ London/Berlin) and Tom Singier (Paris/Berlin), founder of Serigraffeur Galerie. The Echo stage will offer a genuine taste of techno with DJ sets from DJ Hell (Munich/Berlin) and Alan Oldham (Detroit/Berlin – BPitch), plus a live modular synth performance from Lady Starlight (NYC/Berlin). The evening continues with a trip into house-music history – a visceral retelling of how house became a powerful force in Berlin’s musical kaleidoscope. The Reclaim the Beats Festival stage features sets from influential house DJ and producer Tyree Cooper (Chicago/Berlin) and Eric D. Clark (California/Berlin), the driving force behind the classic track From Disco to Disco, and also showcases a new live hardware set from Sky Deep (LA/NYC/Berlin), and LA queer-scene darling Whitney Day. Guests can take a break from the dancefloor on a chilled outdoor patio, with a soundtrack courtesy of up-and-coming LA selector Stacy Christine. The second night, at the Globe Theatre, lets you (re)discover the Berlin electronic musical landscape, and demonstrates its strong sisterhood with the contemporary LA scene. The From Berlin to LA floor features sets from DIY jetsetter Nine Inch Nilina (LA/ Berlin/ROW), and the DJ, vocalist, producer, and label owner Anna Cavazos (LA/NYC/Berlin), plus Roam Recordings’ Vulinej aka Jeniluv. The upper stage hosts LA essential Kim Anh, “Coma Cat” Tensnake (Hamburg/LA), a highly anticipated new live show from Mouse on Mars and friends, and Germany’s own DJ Koze. Videos and pictures on Facebook, Instagram and below. Press de-brief HERE. 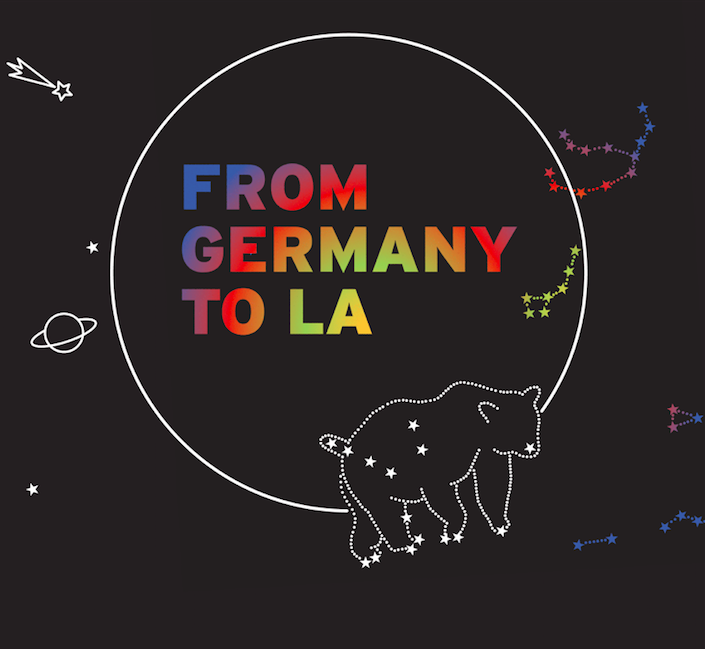 FROM GERMANY TO LA is a part of the Year of German-American Friendship initiative in 2018/19, a comprehensive and collaborative initiative of the Federal Foreign Office, the Goethe-Institut, and with support of the Federation of German Industries (BDI). FROM GERMANY TO LA is presented in partnership with Dublab and Reclaim the Beats Festival, and curated by Your Mom’s Agency.